Just to the south of Velsao Beach is the beautiful stretch of Arossim Beach. Arossim is home to the family of Tristao Braganza Cunha, a pioneer of Goa's freedom struggle and one who advocated nationalism. This beach in Cansaulim village lies south of Velsao Beach. It is also to the north of Utorda Beach in Salcette. From Dabolim Airport, you can take a taxi as it is just 22km from there. 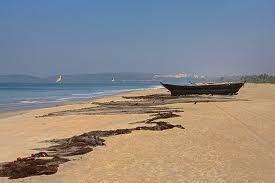 From Vasco, you can get a taxi or rickshaw to reach the beach. From Panaji, you can take a taxi as it is 35km from there. Arossim has the Cansaulim Church to see and explore. There is a difference of opinion as to when church was built but that it was rebuilt in 1632 is certain. Here, the Feast of the three Magi is celebrated with great pomp. Though this beach is quite safe to swim, you should not venture out more than waist-deep in water because there is no lifeguard. There are plenty of eating options to choose from at and around the Arossim beach. Cuisine from most parts of the country and from abroad is available here. As there are not too many options for nightbirds, you'll have to go to other parts of Goa for a wild night out.